Ease in preparation and speed in cooking are what everyone needs when it comes to cookbooks. This book is a sure winner. 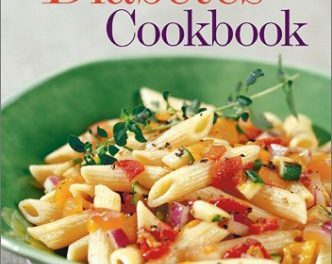 Here readers will find simple and quick recipes for soup, stews, sauces for pasta, and even pot pies. Ruth Glick and Nancy Baggett are two award-winning chefs who have long been a couple of my favorite cookbook authors. 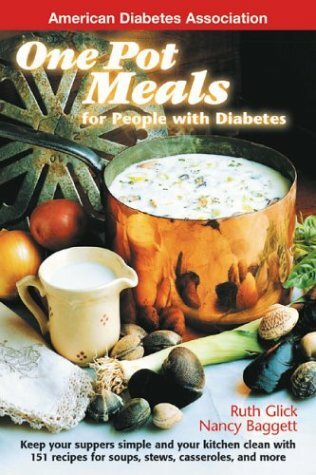 They've come together once again with ONE POT MEALS FOR PEOPLE WITH DIABETES, �2002, a real treasure for those of us who hunger for meals with minimal preparation. 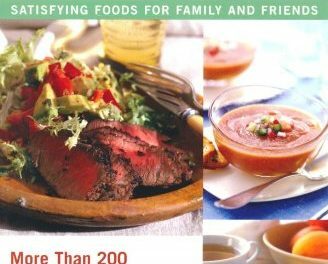 Divided into categories such as Super Quick Dinners, Hearty Soups, Stews, Chilis and Hot Pots, Skillet Dinners, Microwave Specials, Slow Cooker Meals (a personal favorite), Main-Dish Salads and Heart-Healthy Sandwiches and Pizzas, the authors have covered just about every category of "one-pot" cooking you can imagine. Combine that with deliciously healthy recipes and your meal plan will be a sure winner. Having a culinary website which features recipes from many sources, I especially value the anecdotal information accompanying each recipe, such as taste, texture, ingredient information, cooking tips and go-with suggestions. Just as important as the nutritional analysis and Exchanges, is the portion size per serving, which is also included with each recipe. And... each recipe analysis is on the same page with the recipe. Recipes are simple to prepare and I've bookmarked many of them for my return to the kitchen when the weather cools down. I can't wait to try the Beef and Artichoke Skillet (a pasta dish with an Italian accent), Hamburger Stroganoff (a family favorite), Stuffed Peppers, Greek-Style (it's meatless! ), Tamale Pie (a California classic made like a lasagna), Roadhouse Chili (this one might find its way into our September bean feature), Philly Cheese Steak (to which I could easily become addicted), Navy Bean Soup with Ham (a must for cold November nights), or the Italian Bread Soup (hearty peasant fare made with a seasoned crouton stuffing mix). 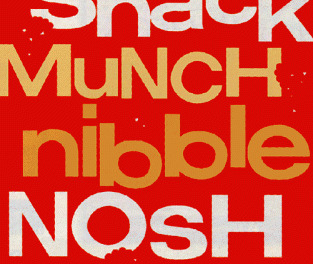 I could go on and on but I'm afraid it would make us all too hungry! If you like traditional and ethnic foods, be sure to take a look at ONE POT MEALS FOR PEOPLE WITH DIABETES. It's another keeper from the winning team of Glick and Baggett, published by the American Diabetes Association.